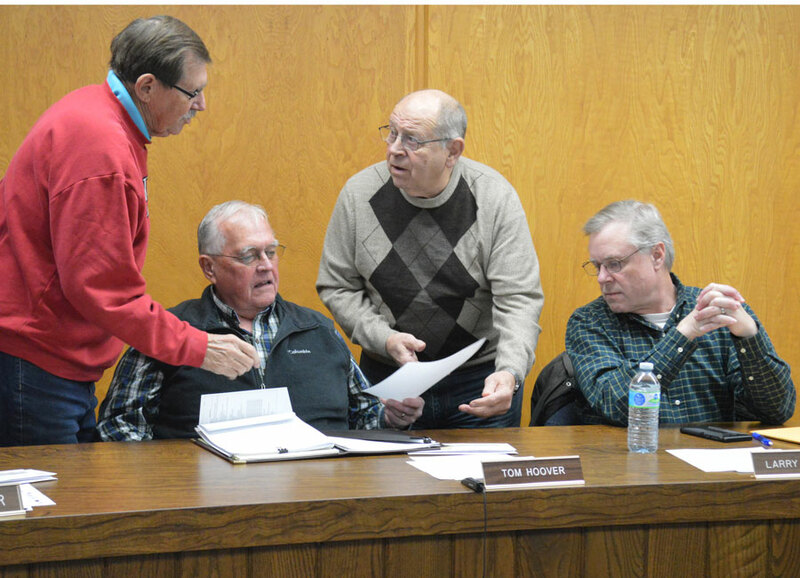 Syracuse Town Council members Bill Musser, left, Tom Hoover, Larry Martindale and Larry Siegel chat prior to the start of the January town council meeting Tuesday night, Jan. 15. SYRACUSE — Syracuse Town Council kicked off the new year by setting a new record for its monthly meeting Tuesday night, Jan. 15. All business was concluded within 27 minutes. The council approved an ordinance adopting public and private sewers and drains regulations. This ordinance updates a similar ordinance passed in 1998. The council also approved adopting the Kosciusko County Multi-Hazard Mitigation Plan. Adopting this plan is required as a condition for future grant funding for mitigation projects. In his first department report, Mike Noe, town manager, told the council in the two weeks he’s been on the job, he’s been busy learning names. He spends Tuesdays and Wednesdays with Henry DeJulia, former town manager. The rest of the week he splits his time between the public utility and town hall. Noe said he has been trying to meet with employees individually. He has been trying to empower the foreman at public utilities to take on more responsibility. He has also been in contact with the Indiana Department of Emergency Management regarding a report for the water and wastewater treatment departments. Don Robinson will sign the report for the water department and Noe will sign the report for the wastewater department. With very cold weather expected in a few days, Noe asked residents and businesses to trickle some water to keep pipes from freezing. Clerk-treasurer Paula Kehr-Wicker asked those who do trickle water to contact her office so their sewer bill can be adjusted. Noe also gave the public works report. He’s been learning about the facility. The wastewater treatment plant now has weekly data posted. The water department is waiting for a pump for the new chlorine system. The pump is currently on back order, but once it’s delivered and installed the system will be ready to go online. The street department has been busy and going to get busier as more cold weather and snow is expected. Police Chief Jim Layne reported the Syracuse Police Department had the highest number of calls in 2018 than in the last five years. The new squad car has been received, outfitted for it and is out on the road. On Feb. 4 the newest officer will be attending the police academy. The council approved paying a $545 fee to the academy. Chad Jonsson, parks superintendent, reported the department received a $10,000 Harkless Foundation Grant to develop Laudeman Park. Adult basketball is underway with 12 teams participating. The Winter Carnival is planned for Jan. 25-26 with the Kiwanis hosting its annual Soup Supper. Other events will be held at Oakwood. It’s unclear whether the snow drags will take place. Fire Chief Mickey Scott said the lake needs 8-10 inches of ice for it to be safe for vehicles to be on it. Scott reported the Turkey Creek Fire Department had 1,304 runs and saved $2 million in property last year. The department received a K21 Foundation grant to purchase four cardiac monitors. Renovation work has started on Station II and continues at Station I.
Councilman Bill Musser reported the Dam Committee has been meeting and will have announcements in the spring.